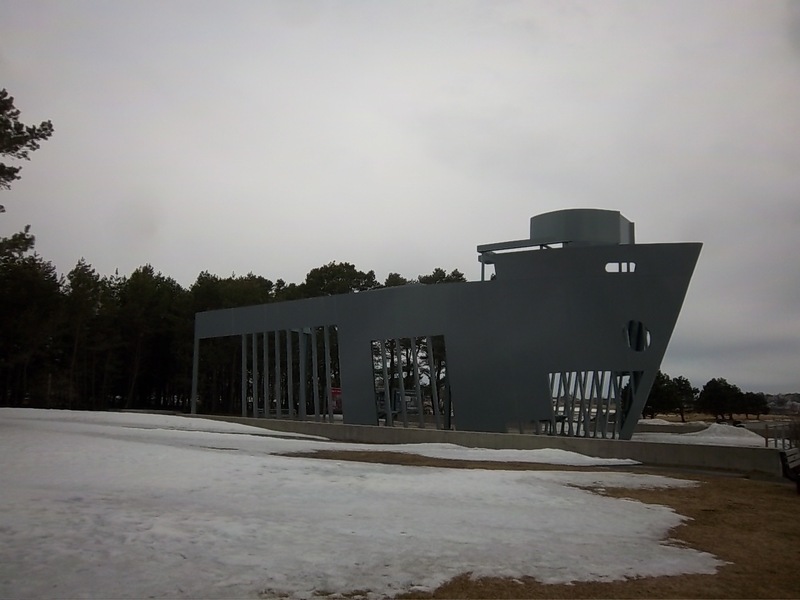 Set in the midst of a pine grove on the shores of scenic Casco Bay is a memorial to the Liberty Ships built on this site during World War II. Facing out to sea, there is a full size steel mock-up of the bow of the ships. There were 266 of these ships built between 1941 and 1945 at this 140 acre ship yard. Approximately 30,000 men and women worked here on as many as thirteen ships at one time. 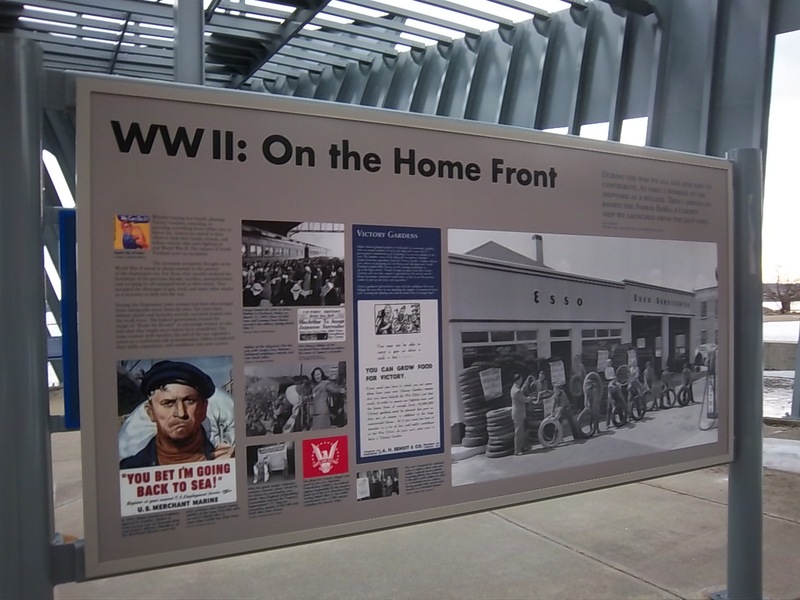 The Liberty Ships were cargo vessels carrying crucial supplies to the European Allies; without these supplies the Allies could not have won the War. 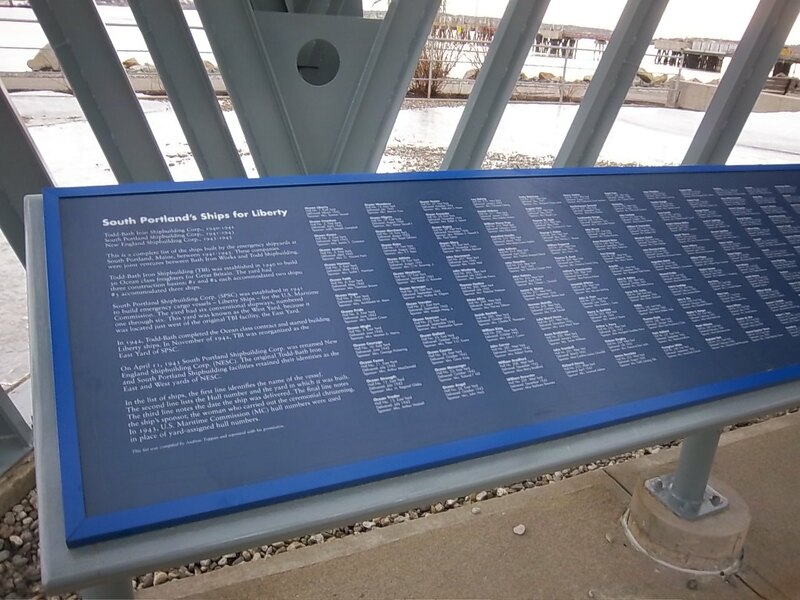 Inside the mock-up is a plaque with the names of the 266 ships built here. That number, 266 ships, is just a number. 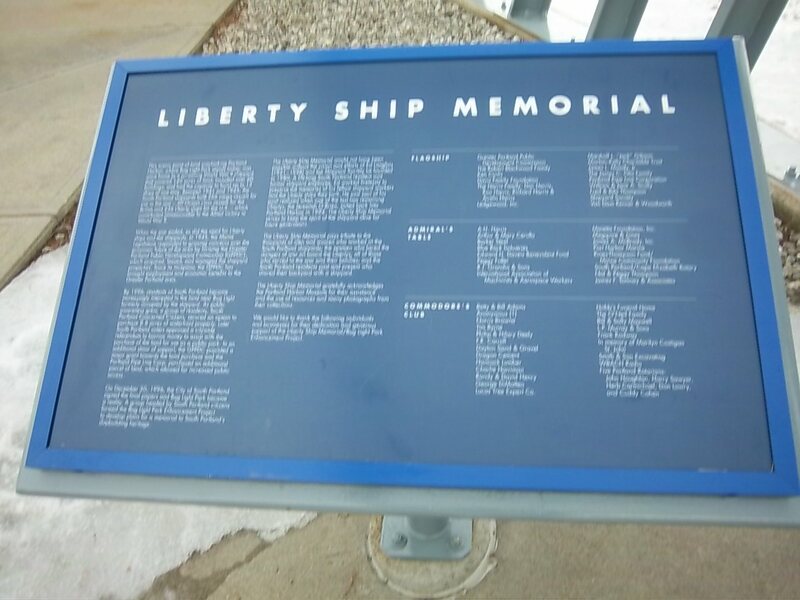 But the long plaque engraved with all the names of those ships helps us to convert that number to actual ships. 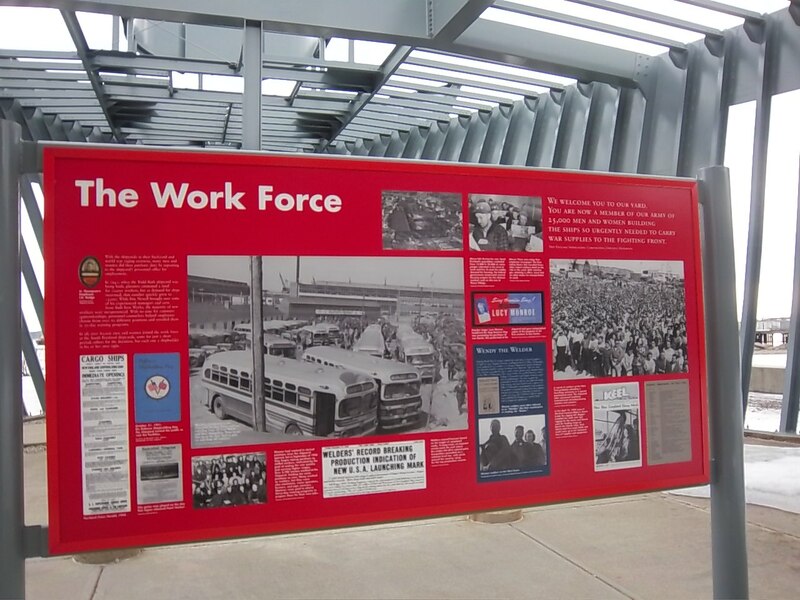 There are also three informational double-sided boards with engrossing facts, figures and reproductions. My father was one of the 30,000 who worked here. When I look at the informational boards, I remember stories he told me about working here. The pictures and reproductions of newspapers bring this era to life and help us to have a greater appreciation of those years. It is so important for us to have memorials like this one so that we don’t forget crucial episodes in our history. Prior to the War, this area was known as Cushing’s Point which was a tranquil fishing community in South Portland. 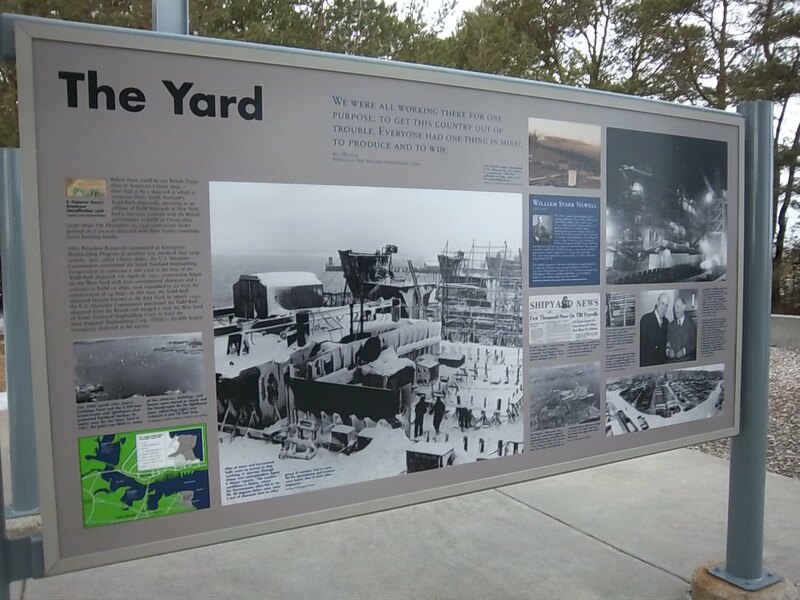 The land was appropriated and the natural harbor there was filled in to make enough land for the shipyard to operate. 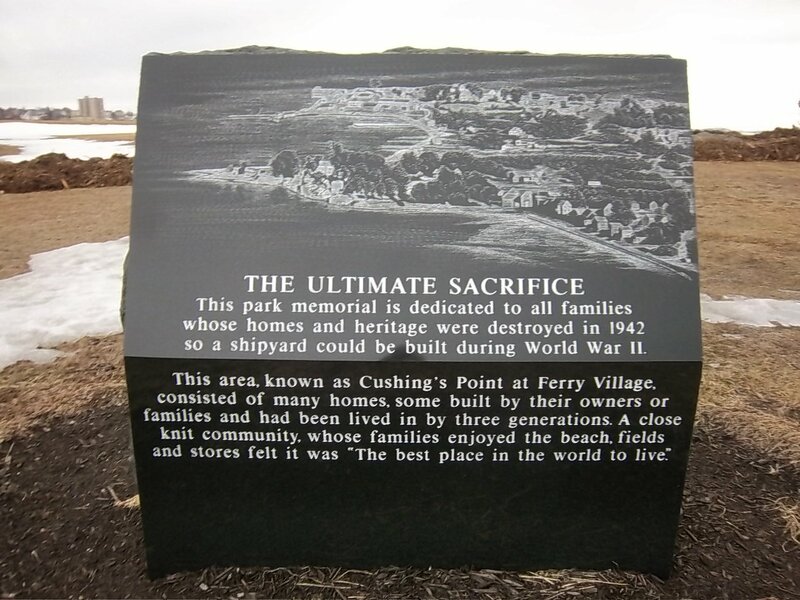 At the entrance to the park, there is a polished black marble marker dedicated to the Cushing Island community. The home of the Liberty Ship Memorial on the site of the shipyard is now known as Bug Light Park. The views of Casco Bay from the park are stunning. This gorgeous park is one jewel on the necklace of public parks that range from the Eastern Promenade in Portland to Bug Light Park and Spring Point in South Portland to Fort Williams and Two Lights in Cape Elizabeth. Even though there are large patches of white on the landscape, the turquoise beauty of Casco Bay is still dazzling on these cold, winter days. There is a walkway here along the shoreline. 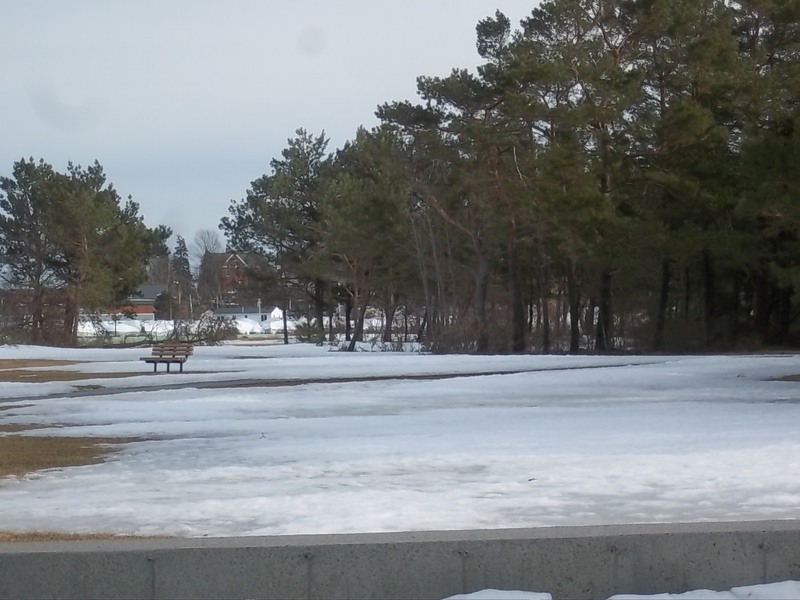 When you visit, leave enough time to walk here and enjoy the beauty of this area. 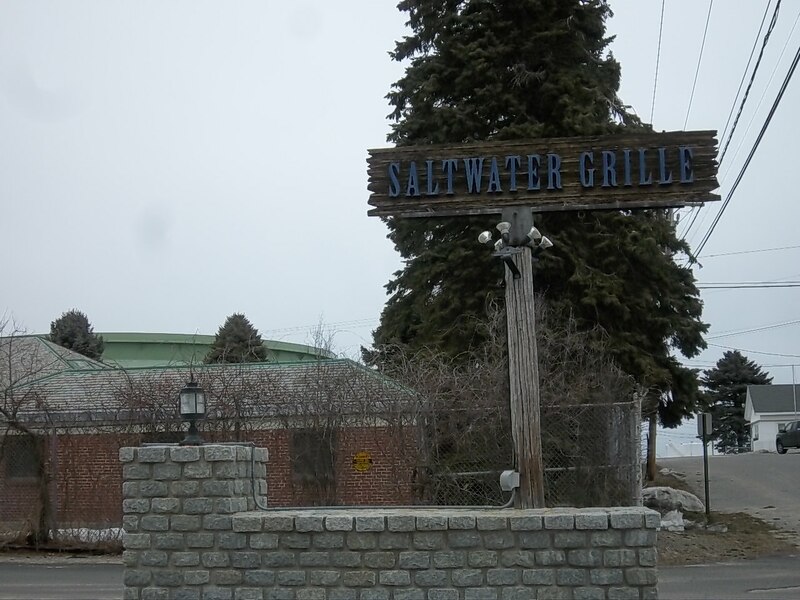 From this site, there is a very good restaurant just about a mile away; the Saltwater Grille, at 231 Front Street, South Portland. The Grille is a full service restaurant on the waterfront, with an outside deck for summer dining. At nighttime the lights of Portland on the other side sparkle across the bay. Their lobster corn bisque is a favorite of mine. Include a visit to this restaurant after you view the memorial. 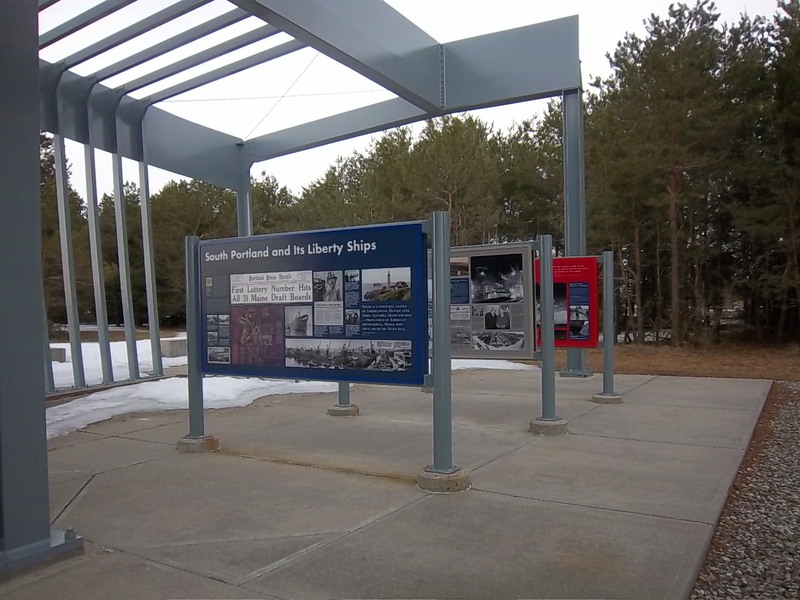 Directions to the Liberty Ship Memorial: In South Portland drive to the end of Broadway and turn left on Breakwater Drive. Then turn right onto Madison Street which curves to the left. Turn right off Madison Street before the entrance to the boat launch. The Cushing’s Point marker is located here and the ship memorial is straight ahead. To reach the restaurant, backtrack to Broadway and turn right at the blinking light to Sawyer Street. At the end of Sawyer Street, turn left onto Front Street. 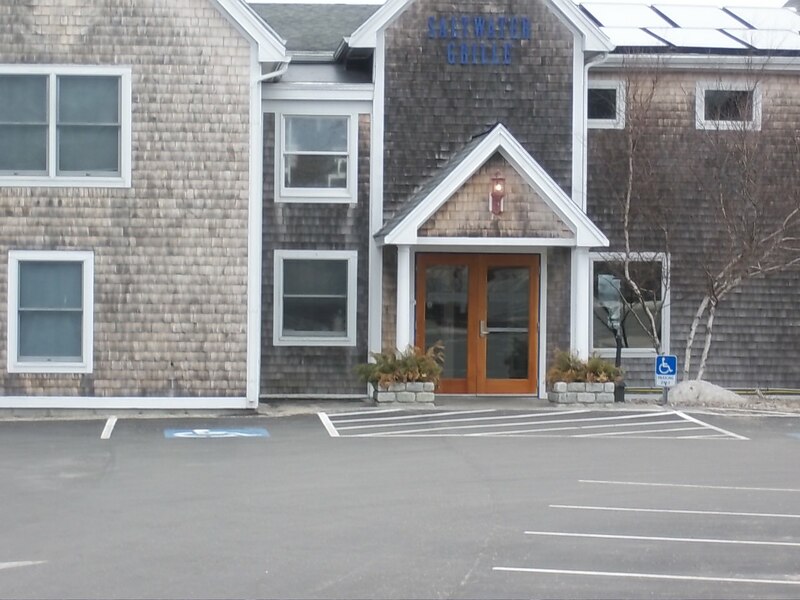 The Saltwater Grille is just a few feet to the right. This entry was posted in Uncategorized and tagged Bug Light Park, Casco Bay, Liberty Ship Memorial, Liberty Ships, Salt Water Grille, South Portland Maine. Bookmark the permalink.